It’s is almost Valentine’s Day. It is also quickly approaching Tax Day. 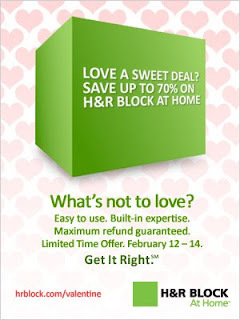 So, H&R Block is offering up a SWEETHEART of a deal starting February 12th and running through the 14th. You can get ANY H&R Block At Home Online Product for only $14.00 (state is an additional charge). This is a savings of 50% off of H&R Block at Home Deluxe and a 70% discount off of the H&R Block at Home Premium!! This is a HOT deal!! What I really found impressive is that you don’t even have to do your taxes this weekend! You can just go ahead and purchase your software and it will be waiting for you when you are ready — but you still get it for only $14.00. Can you tell I’m excited about this deal!?!? Now – the kicker is that you MUST go through this link to get the deal – but that is a no brainer for nearly free tax software! 1. Follow me through a reader. 3. Become a fan on Facebook. 4. Receive my daily email digests. Be sure to leave a separate comment for each entry – which will give you up to 4 entries. In addition – since this is a 24 hour giveaway — you must leave me contact information so that I can reach you as soon as the giveaway ends. If you are a chosen winner and I do not have your email in your entry, then I will choose the next winner. As usual, the winner will be chosen via random.org.